Posted on July 26, 2016 at 2:42 am. 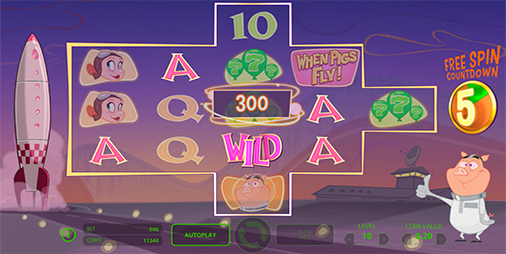 Casino software giant Net Entertainment expanded its online pokies collection even further last week with the release of When Pigs Fly. Available now at leading NetEnt casinos, the new title features a classic cartoony theme that belies its innovative gameplay format. Most striking of all is the reel layout, which expands to reveal more active symbols with each consecutive win via the re-spins feature. Five successful re-spins in a row unlocks the bonus round, where players can enjoy eight free spins with 3125 ways to win. “NetEnt delivers innovative, unique themes and When Pigs Fly is just another example of a game that really stands out from the crowd,” said NetEnt’s Chief Product Officer, Simon Hammon. When Pigs Fly also comes with a fixed jackpot of 480,000 coins and a wild feature that swaps for any symbol in both the base game and the free spins bonus. Australian pokies players can enjoy this exciting new release right now at Leo Vegas – our top-ranked instant play casino site for NetEnt pokie games.